Ronnie Biggs, the former fugitive who helped stage Britain's "Great Train Robbery" in 1963, has been released from prison, marking the end of a criminal saga that has played out over 40 years and across four continents. Biggs and 14 other men robbed a Royal Mail train of 2.6 million pounds (about $67 million in today's terms). The gang, which included an antiques dealer, a boxer and a florist, beat the train's driver unconscious with an iron bar; the victim never worked again and died seven years later. Biggs was sentenced to 30 years in prison for his part in the incident, but he escaped after 15 months by scaling a 30-ft. (9 m) wall and jumping into a furniture van. 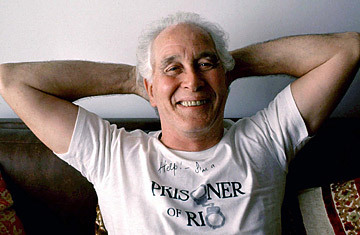 After more than 35 years on the run in Australia and Brazil, Biggs returned to the U.K. in 2001 for medical treatment. U.K. Justice Secretary Jack Straw freed Biggs on compassionate grounds and announced his decision on Aug. 6 in an e-mailed statement. "The medical evidence clearly shows that Mr. Biggs is very ill and that his condition has deteriorated recently, culminating in his re-admission to hospital," he said. "His condition is not expected to improve." Biggs, age 79 and severely ill with pneumonia, remains at a hospital in Norwich, where is to undergo minor surgery. Following a series of strokes, he can no longer walk, is fed through a tube and communicates by pointing to letters of the alphabet on a board. The three prison guards who stood watch over his hospital bed round the clock have been removed. Their departure comes just one day ahead of Biggs' 80th birthday and the 46th anniversary of the train robbery on Aug. 8. "I had a private moment with my dad to thank him for sticking with it," his son Michael told reporters outside the hospital after the papers freeing his father were signed. "It was very emotional when the guards left." "My father still has a sense of humor  he shook hands with the prison guards and then just waved them off with his hands." Biggs demonstrated that same flamboyance during three decades on the run. After his escape from prison in 1965, he fled to Paris, where he underwent plastic surgery and obtained new identity papers, which he used to enter Australia. In 1969 he got wind that authorities had tracked him to Melbourne, so he smuggled himself onto a passenger liner to Panama and eventually made his way to Brazil. In 1974, tabloid journalists from Britain's Daily Express broke the news that Biggs was hiding out in Rio de Janeiro. Scotland Yard's subsequent efforts to extradite him were foiled after Biggs fathered a child, Michael, with Raimunda de Castro, a nightclub dancer and alleged prostitute; Brazilian law protected the parents of Brazilian citizens. And while Biggs could not legally work in Brazil, he was able to live freely and profit from coffee mugs and T shirts branded with his name and image. There were downsides to having a high profile. In 1981 a group of bounty hunters kidnapped Biggs, sneaked him into Barbados and asked the British government for a reward. But Barbados did not have an extradition treaty with the U.K., and Biggs again escaped justice. In 2001, after 13,068 days on the run, Biggs returned to Britain on a chartered plane paid for by British tabloid the Sun. Having suffered a series of heart attacks, Biggs reportedly returned seeking medical attention. However, through his son he told reporters that he returned to spend his final days in his native land. "My last wish is to walk into a Margate pub as an Englishman and buy a pint of bitter." Giovanni Di Stefano, the family's attorney, said he was pleased with Biggs' release but remains mindful of the former prisoner's health. "He is being released effectively to die, and that cannot be considered a victory," he said. And what about that final pint? "This man is ill  he's going to die. He is not going to any pub." See pictures of bobbies on the beat.